syn 2–23 s α 9.71 285mCn ? syn 5.5 s α 10.29 283mCn ? In the periodic table of the elements, it is a transactinide element in the p-block. It is a member of the 7th period and is the heaviest known member of the carbon group; it is also the heaviest element whose chemistry is currently known. Initial chemical studies performed in 2007–2008 indicated that flerovium was unexpectedly volatile for a group 14 element; in preliminary results it even seemed to exhibit properties similar to those of the noble gases. More recent results show that flerovium's reaction with gold is similar to that of copernicium, showing that it is a very volatile element that may even be gaseous at standard temperature and pressure, that it would show metallic properties, consistent with it being the heavier homologue of lead, and that it would be the least reactive metal in group 14. About 90 atoms of flerovium have been observed: 58 were synthesized directly, and the rest were made from the radioactive decay of heavier elements. All of these flerovium atoms have been shown to have mass numbers from 284 to 289. The most stable known flerovium isotope, flerovium-289, has a half-life of around 2.6 seconds, but it is possible that this isotope may have a nuclear isomer with a longer half-life of 66 seconds; this would be one of the longest half-lives of any isotope of a superheavy element. Flerovium is predicted to be near the centre of the theorized island of stability, and it is expected that heavier flerovium isotopes, especially the possibly doubly magic flerovium-298, may have even longer half-lives. From the late 1940s to the early 1960s, the early days of the synthesis of heavier and heavier transuranium elements, it was predicted that since such heavy elements did not occur naturally, they would have shorter and shorter half-lives to spontaneous fission, until they stopped existing altogether at around element 108 (now known as hassium). Initial work in the synthesis of the actinides appeared to confirm this. The nuclear shell model, introduced in the late 1960s, stated that the protons and neutrons formed shells within a nucleus, somewhat analogous to electrons forming electron shells within an atom. The noble gases are unreactive due to their having full electron shells; thus it was theorized that elements with full nuclear shells – having so-called "magic" numbers of protons or neutrons – would be stabilized against radioactive decay. A doubly magic isotope, having magic numbers of both protons and neutrons, would be especially stabilized, and it was calculated that the next doubly magic isotope after lead-208 would be flerovium-298 with 114 protons and 184 neutrons, which would form the centre of a so-called "island of stability". This island of stability, supposedly ranging from copernicium (element 112) to oganesson (118), would come after a long "sea of instability" from elements 101 (mendelevium) to 111 (roentgenium), and the flerovium isotopes in it were speculated in 1966 to have half-lives in excess of a hundred million years. It took thirty years for the first isotopes of flerovium to be synthesized. More recent work suggests that the local islands of stability around hassium and flerovium are due to these nuclei being respectively deformed and oblate, which make them resistant to spontaneous fission, and that the true island of stability for spherical nuclei occurs at around unbibium-306 (with 122 protons and 184 neutrons). A single atom of flerovium, decaying by alpha emission with a lifetime of 30.4 seconds, was detected. The decay energy measured was 9.71 MeV, giving an expected half-life of 2–23 s. This observation was assigned to the isotope flerovium-289 and was published in January 1999. The experiment was later repeated, but an isotope with these decay properties was never found again and hence the exact identity of this activity is unknown. It is possible that it was due to the metastable isomer 289mFl. Seaborg died a month later, on 25 February 1999. In March 1999, the same team replaced the 244Pu target with a 242Pu one in order to produce other flerovium isotopes. This time two atoms of flerovium were produced, decaying via alpha emission with a half-life of 5.5 s. They were assigned as 287Fl. This activity has not been seen again either, and it is unclear what nucleus was produced. It is possible that it was the meta-stable isomer 287mFl. The now-confirmed discovery of flerovium was made in June 1999 when the Dubna team repeated the first reaction from 1998. This time, two atoms of element 114 were produced; they alpha decayed with a half-life of 2.6 s, different from the 1998 result. This activity was initially assigned to 288Fl in error, due to the confusion regarding the previous observations that were assumed to come from 289Fl. Further work in December 2002 finally allowed a positive reassignment of the June 1999 atoms to 289Fl. Using Mendeleev's nomenclature for unnamed and undiscovered elements, flerovium is sometimes called eka-lead. In 1979, IUPAC published recommendations according to which the element was to be called ununquadium (with the corresponding symbol of Uuq), a systematic element name as a placeholder, until the discovery of the element is confirmed and a permanent name is decided on. Some scientists in the field called it "element 114", with the symbol of (114) or 114. According to IUPAC recommendations, the discoverer(s) of a new element has the right to suggest a name. After the discovery of flerovium and livermorium was recognized by IUPAC on 1 June 2011, IUPAC asked the discovery team at the JINR to suggest permanent names for those two elements. The Dubna team chose to name element 114 flerovium (symbol Fl), after the Russian Flerov Laboratory of Nuclear Reactions (FLNR), named after the Soviet physicist Georgy Flyorov (also spelled Flerov); earlier reports claim the element name was directly proposed to honour Flerov. 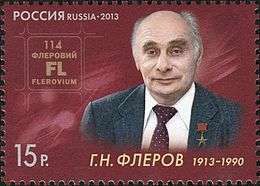 In accordance with the proposal received from the discoverers IUPAC officially named flerovium after the Flerov Laboratory of Nuclear Reactions (an older name for the JINR), not after Flyorov himself. Flyorov is known for writing to Stalin in April 1942 and pointing out the silence in scientific journals in the field of nuclear fission in the United States, Great Britain, and Germany. Flyorov deduced that this research must have become classified information in those countries. Flyorov's work and urgings led to the development of the USSR's own atomic bomb project. The physical basis of the chemical periodicity governing the periodic table is the electron shell closures at each noble gas (atomic numbers 2, 10, 18, 36, 54, 86, and 118): as any further electrons must enter a new shell with higher energy, closed-shell electron configurations are markedly more stable, leading to the relative inertness of the noble gases. Since protons and neutrons are also known to arrange themselves in closed nuclear shells, the same effect happens at nucleon shell closures, which happen at specific nucleon numbers often dubbed "magic numbers". The known magic numbers are 2, 8, 20, 28, 50, and 82 for protons and neutrons, and also 126 for neutrons. Nucleons with magic proton and neutron numbers, such as helium-4, oxygen-16, calcium-48, and lead-208, are termed "doubly magic" and are very stable against decay. This property of increased nuclear stability is very important for superheavy elements: without any stabilization, their half-lives would be expected by exponential extrapolation to be in the range of nanoseconds (10−9 s) when element 110 (darmstadtium) is reached, because of the ever-increasing repulsive electromagnetic forces between the positively charged protons that overcome the limited-range strong nuclear force that holds the nucleus together. The next closed nucleon shells and hence magic numbers are thought to be at the centre of the long-sought island of stability, where the half-lives to alpha decay and spontaneous fission lengthen again. Initially, by analogy with the neutron magic number 126, the next proton shell was also expected to occur at element 126, too far away from the synthesis capabilities of the mid-20th century to achieve much theoretical attention. In 1966, new values for the potential and spin-orbit interaction in this region of the periodic table contradicted this and predicted that the next proton shell would occur instead at element 114, and that nuclides in this region would be as stable against spontaneous fission as many heavy nuclei such as lead-208. The expected closed neutron shells in this region were at neutron number 184 or 196, thus making 298Fl and 310Fl candidates for being doubly magic. 1972 estimates predicted a half-life of about a year for 298Fl, which was expected to be near a large island of stability with the longest half-life at darmstadtium-294 (1010 years, comparable to that of 232Th). After the synthesis of the first isotopes of elements 112 through 118 at the turn of the 21st century, it was found that the synthesized neutron-deficient isotopes were stabilized against fission. In 2008 it was thus hypothesized that the stabilization against fission of these nuclides was due to their being oblate nuclei, and that a region of oblate nuclei was centred on 288Fl. Additionally, new theoretical models showed that the expected gap in energy between the proton orbitals 2f7/2 (filled at element 114) and 2f5/2 (filled at element 120) was smaller than expected, so that element 114 no longer appeared to be a stable spherical closed nuclear shell. The next doubly magic nucleus is now expected to be around 306Ubb, but the expected low half-life and low production cross section of this nuclide makes its synthesis challenging. Nevertheless, the island of stability is still expected to exist in this region of the periodic table, and nearer its centre (which has not been approached closely enough yet) some nuclides, such as 291Mc and its alpha- and beta-decay daughters,[lower-alpha 1] may be found to decay by positron emission or electron capture and thus move into the centre of the island. Due to the expected high fission barriers, any nucleus within this island of stability decays exclusively by alpha decay and perhaps some electron capture and beta decay, both of which would bring the nuclei closer to the beta stability line where the island is expected to be. Electron capture is needed to reach the island, which is problematic because it is not certain that electron capture becomes a major decay mode in this region of the chart of nuclides. Several experiments have been performed between 2000 and 2004 at the Flerov Laboratory of Nuclear Reactions in Dubna studying the fission characteristics of the compound nucleus 292Fl by bombarding a plutonium-244 target with accelerated calcium-48 ions. A compound nucleus is a loose combination of nucleons that have not yet arranged themselves into nuclear shells. It has no internal structure and is held together only by the collision forces between the target and projectile nuclei. [lower-alpha 2] The results revealed how nuclei such as this fission predominantly by expelling doubly magic or nearly doubly magic fragments such as calcium-40, tin-132, lead-208, or bismuth-209. It was also found that the yield for the fusion-fission pathway was similar between calcium-48 and iron-58 projectiles, indicating a possible future use of iron-58 projectiles in superheavy element formation. It has also been suggested that a neutron-rich flerovium isotope can be formed by the quasifission (partial fusion followed by fission) of a massive nucleus. Recently it has been shown that the multi-nucleon transfer reactions in collisions of actinide nuclei (such as uranium and curium) might be used to synthesize the neutron-rich superheavy nuclei located at the island of stability, although production of neutron-rich nobelium or seaborgium nuclei is more likely. Due to the spin-orbit splitting of the 7p subshell being very large in flerovium, and the fact that both flerovium's filled orbitals in the seventh shell are stabilized relativistically, the valence electron configuration of flerovium may be considered to have a completely filled shell, making flerovium a very noble metal. Its first ionization energy of 8.539 eV (823.9 kJ/mol) should be the highest in group 14. The 6d electron levels are also destabilized, and may still be able to participate in chemical reactions in flerovium (but not the later 7p elements), which might allow it to behave in some ways like transition metals and allow higher oxidation states such as +4 and +6. They should be less stable than the +2 state, following periodic trends, and may only be stable in flerovium fluorides. The closed-shell electron configuration of flerovium results in the metallic bonding in metallic flerovium being weaker than in the preceding and following elements; thus, flerovium is expected to have a low boiling point, and has recently been suggested to be possibly a gaseous metal, similar to the predictions for copernicium, which also has a closed-shell electron configuration. The melting and boiling points of flerovium are predicted to be around 70 °C and 150 °C, significantly lower than the values for the lighter group 14 elements (those of lead are 327 °C and 1749 °C respectively), and continuing the trend of decreasing boiling points down the group. Although earlier studies predicted a boiling point of ~1000 °C or 2840 °C, this is now considered unlikely because of the expected weak metallic bonding in flerovium and that group trends would expect flerovium to have a low sublimation enthalpy. In the solid state, flerovium is expected to be a dense metal due to its high atomic weight, with a density variously predicted to be either 22 g·cm−3 or 14 g·cm−3. The electron of the hydrogen-like flerovium ion (oxidized so that it only has one electron, Fl113+) is expected to move so fast that it has a mass 1.79 times that of a stationary electron, due to relativistic effects. For comparison, the figures for hydrogen-like lead and tin are expected to be 1.25 and 1.073 respectively. Flerovium would form weaker metal–metal bonds than lead and would be adsorbed less on surfaces. 3 are predicted to form preferentially in flerovium-containing solutions. The sd hybridizations might be possible as the 7s and 6d electrons in flerovium share approximately the same energy, perhaps making even higher oxidation states like +6 possible with extremely electronegative elements, such as in flerovium(VI) fluoride (FlF6). In general, the spin-orbit contraction of the 7p1/2 orbital should lead to smaller bond lengths and larger bond angles: this has been theoretically confirmed in FlH2. 2) in aqueous solution, analogous to plumbite. Flerovium(II) sulfate (FlSO4) and sulfide (FlS) should be very insoluble in water, and flerovium(II) acetate (FlC2H3O2) and nitrate (Fl(NO3)2) should be quite water-soluble. The standard electrode potential for the reduction of Fl2+ ions to metallic flerovium is estimated to be around +0.9 V, confirming the increased stability of flerovium in the neutral state. In general, due to the relativistic stabilization of the 7p1/2 spinor, Fl2+ is expected to have properties intermediate between those of Hg2+ or Cd2+ and its lighter congener Pb2+. The standard electrode potential for the Fl2+/Fl couple is predicted to be −0.9 V.
Flerovium is currently the heaviest element to have had its chemistry experimentally investigated. Two experiments were performed in April–May 2007 in a joint FLNR-PSI collaboration aiming to study the chemistry of copernicium. The first experiment involved the reaction 242Pu(48Ca,3n)287Fl and the second the reaction 244Pu(48Ca,4n)288Fl: these reactions produce short-lived flerovium isotopes whose copernicium daughters would then be studied. The adsorption properties of the resultant atoms on a gold surface were compared with those of radon, as it was then expected that copernicium's full-shell electron configuration would lead to noble-gas like behaviour. Noble gases interact with metal surfaces very weakly, which is uncharacteristic of metals. The experimental support for a noble-gas-like flerovium was soon to weaken abruptly. In 2009 and 2010, the FLNR-PSI collaboration synthesized further atoms of flerovium to follow up their 2007 and 2008 studies. In particular, the first three flerovium atoms synthesized in the 2010 study suggested again a noble-gas-like character, but the complete set taken together resulted in a more ambiguous interpretation, unusual for a metal in the carbon group but not fully like a noble gas in character. In their paper, the scientists refrained from calling flerovium's chemical properties "close to those of noble gases", as had previously been done in the 2008 study. Flerovium's volatility was again measured through interactions with a gold surface, and provided indications that the volatility of flerovium was comparable to that of mercury, astatine, and the simultaneously investigated copernicium, which had been shown in the study to be a very volatile noble metal, conforming to its being the heaviest group 12 element known. Nevertheless, it was pointed out that this volatile behaviour was not expected for a usual group 14 metal. In even later experiments from 2012 at the GSI, the chemical properties of flerovium were revealed to be more metallic than noble-gas-like. Jens Volker Kratz and Christoph Düllmann specifically named copernicium and flerovium as belonging to a new category of "volatile metals"; Kratz even speculated that they might be gaseous at standard temperature and pressure. These "volatile metals", as a category, were expected to fall between normal metals and noble gases in terms of adsorption properties. Contrary to the 2009 and 2010 results, it was shown in the 2012 experiments that the interactions of flerovium and copernicium respectively with gold were about equal. Further studies showed that flerovium was more reactive than copernicium, in contradiction to previous experiments and predictions. ↑ Specifically, 291Mc, 291Fl, 291Nh, 287Nh, 287Cn, 287Rg, 283Rg, and 283Ds, which are expected to decay to the relatively longer-lived nuclei 279Mt, 283Mt, 287Ds, and 291Cn. ↑ It is estimated that it requires around 10−14 s for the nucleons to arrange themselves into nuclear shells, at which point the compound nucleus becomes an nuclide, and this number is used by IUPAC as the minimum half-life a claimed isotope must have to be recognized as a nuclide. 1 2 3 4 5 6 7 8 9 10 11 12 13 14 15 16 17 18 19 20 21 22 Hoffman, Darleane C.; Lee, Diana M.; Pershina, Valeria (2006). "Transactinides and the future elements". In Morss; Edelstein, Norman M.; Fuger, Jean. The Chemistry of the Actinide and Transactinide Elements (3rd ed.). Dordrecht, The Netherlands: Springer Science+Business Media. ISBN 1-4020-3555-1. 1 2 3 4 5 6 Schwerdtfeger, Peter; Seth, Michael (2002). "Relativistic Quantum Chemistry of the Superheavy Elements. Closed-Shell Element 114 as a Case Study." (PDF). Journal of Nuclear and Radiochemical Sciences. 3 (1): 133–136. Retrieved 12 September 2014. 1 2 "Element 114 is Named Flerovium and Element 116 is Named Livermorium" (Press release). IUPAC. 30 May 2012. 1 2 Utyonkov, V. K.; Brewer, N. T.; Oganessian, Yu. Ts. ; Rykaczewski, K. P.; Abdullin, F. Sh. ; Dmitriev, S. N.; Grzywacz, R. K.; Itkis, M. G.; Miernik, K.; Polyakov, A. N.; Roberto, J. B.; Sagaidak, R. N.; Shirokovsky, I. V.; Shumeiko, M. V.; Tsyganov, Yu. S.; Voinov, A. A.; Subbotin, V. G.; Sukhov, A. M.; Sabel'nikov, A. V.; Vostokin, G. K.; Hamilton, J. H.; Stoyer, M. A.; Strauss, S. Y. (15 September 2015). "Experiments on the synthesis of superheavy nuclei 284Fl and 285Fl in the 239,240Pu + 48Ca reactions". Physical Review C. 92 (3). doi:10.1103/PhysRevC.92.034609. 1 2 Gäggeler, H. W. (5–7 November 2007). "Gas Phase Chemistry of Superheavy Elements" (PDF). Paul Scherrer Institute. Archived from the original (PDF) on 20 February 2012. Retrieved 10 August 2013. 1 2 3 4 5 Sacks, O. (8 February 2004). "Greetings From the Island of Stability". The New York Times. ↑ Emsley, John (2011). Nature's Building Blocks: An A-Z Guide to the Elements (New ed.). New York, NY: Oxford University Press. p. 580. ISBN 978-0-19-960563-7. 1 2 3 4 5 6 7 8 Kratz, J. V. (5 September 2011). The Impact of Superheavy Elements on the Chemical and Physical Sciences (PDF). 4th International Conference on the Chemistry and Physics of the Transactinide Elements. Retrieved 27 August 2013. 1 2 Oganessian, Yu. Ts. ; et al. (1999). "Synthesis of Superheavy Nuclei in the 48Ca + 244Pu Reaction" (PDF). Physical Review Letters. 83 (16): 3154. Bibcode:1999PhRvL..83.3154O. doi:10.1103/PhysRevLett.83.3154. 1 2 Oganessian, Yu. Ts. ; et al. (2000). "Synthesis of superheavy nuclei in the 48Ca + 244Pu reaction: 288Fl". Physical Review C. 62 (4): 041604. Bibcode:2000PhRvC..62d1604O. doi:10.1103/PhysRevC.62.041604. ↑ Oganessian, Yu. Ts. ; et al. (2004). 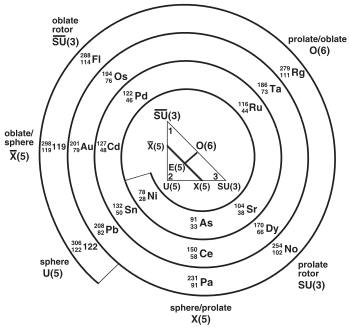 "Measurements of cross sections and decay properties of the isotopes of elements 112, 114, and 116 produced in the fusion reactions 233,238U, 242Pu, and 248Cm + 48Ca" (PDF). Physical Review C. 70 (6): 064609. Bibcode:2004PhRvC..70f4609O. doi:10.1103/PhysRevC.70.064609. Archived from the original (PDF) on 28 May 2008. 1 2 3 Browne, M. W. (27 February 1999). "Glenn Seaborg, Leader of Team That Found Plutonium, Dies at 86". The New York Times. Archived from the original on 22 May 2013. Retrieved 26 August 2013. ↑ Oganessian, Yu. Ts. ; et al. (1999). "Synthesis of nuclei of the superheavy element 114 in reactions induced by 48Ca". Nature. 400 (6741): 242. Bibcode:1999Natur.400..242O. doi:10.1038/22281. 1 2 Oganessian, Yu. Ts. ; et al. (2004). "Measurements of cross sections for the fusion-evaporation reactions 244Pu(48Ca,xn)292−x114 and 245Cm(48Ca,xn)293−x116". Physical Review C. 69 (5): 054607. Bibcode:2004PhRvC..69e4607O. doi:10.1103/PhysRevC.69.054607. ↑ Barber, R. C.; Gäggeler, H. W.; Karol, P. J.; Nakahara, H.; Vardaci, E.; Vogt, E. (2009). "Discovery of the element with atomic number 112 (IUPAC Technical Report)". Pure and Applied Chemistry. 81 (7): 1331. doi:10.1351/PAC-REP-08-03-05. ↑ Barber, R. C.; Karol, P. J.; Nakahara, H.; Vardaci, E.; Vogt, E. W. (2011). "Discovery of the elements with atomic numbers greater than or equal to 113 (IUPAC Technical Report)". Pure and Applied Chemistry. 83 (7): 1485. doi:10.1351/PAC-REP-10-05-01. ↑ Brown, M. (6 June 2011). "Two Ultraheavy Elements Added to Periodic Table". Wired. Retrieved 7 June 2011. 1 2 Welsh, J. (2 December 2011). "Two Elements Named: Livermorium and Flerovium". LiveScience. Retrieved 2 December 2011. ↑ "Российские физики предложат назвать 116 химический элемент московием" [Russian physicists have offered to call 116 chemical element moscovium]. RIA Novosti. 26 March 2011. Retrieved 8 May 2011. Mikhail Itkis, the vice-director of JINR stated: "We would like to name element 114 after Georgy Flerov – flerovium, and the second [element 116] – moscovium, not after Moscow, but after Moscow Oblast". ↑ Kalinkin, B. N.; Gareev, F. A. (2001). "Synthesis of Superheavy elements and Theory of Atomic Nucleus". arXiv:nucl-th/0111083v2 . 1 2 3 4 5 6 7 8 Zagrebaev, Valeriy; Karpov, Alexander; Greiner, Walter (2013). "Future of superheavy element research: Which nuclei could be synthesized within the next few years?" (PDF). Journal of Physics: Conference Series. 420. IOP Science. pp. 1–15. Retrieved 20 August 2013. 1 2 "JINR Annual Reports 2000–2006". JINR. Retrieved 27 August 2013. 1 2 Emsley, John (2011). Nature's Building Blocks: An A-Z Guide to the Elements (New ed.). New York, NY: Oxford University Press. p. 590. ISBN 978-0-19-960563-7. 1 2 3 Zagrebaev, V.; Greiner, W. (2008). "Synthesis of superheavy nuclei: A search for new production reactions". Physical Review C. 78 (3): 034610. arXiv:0807.2537 . Bibcode:2008PhRvC..78c4610Z. doi:10.1103/PhysRevC.78.034610. ↑ Chowdhury, P. R.; Samanta, C.; Basu, D. N. (2006). "α decay half-lives of new superheavy elements". 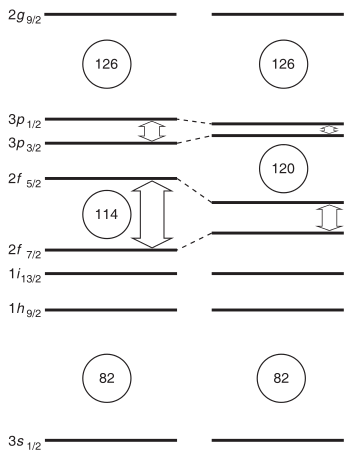 Physical Review C. 73 (1): 014612. arXiv:nucl-th/0507054 . Bibcode:2006PhRvC..73a4612C. doi:10.1103/PhysRevC.73.014612. ↑ Samanta, C.; Chowdhury, P. R.; Basu, D. N. (2007). "Predictions of alpha decay half lives of heavy and superheavy elements". Nuclear Physics A. 789 (1–4): 142–154. arXiv:nucl-th/0703086 . Bibcode:2007NuPhA.789..142S. doi:10.1016/j.nuclphysa.2007.04.001. ↑ Chowdhury, P. R.; Samanta, C.; Basu, D. N. (2008). "Search for long lived heaviest nuclei beyond the valley of stability". Physical Review C. 77 (4): 044603. arXiv:0802.3837 . Bibcode:2008PhRvC..77d4603C. doi:10.1103/PhysRevC.77.044603. ↑ Roy Chowdhury, P.; Samanta, C.; Basu, D. N. (2008). "Nuclear half-lives for α-radioactivity of elements with 100 ≤ Z ≤ 130". Atomic Data and Nuclear Data Tables. 94 (6): 781–806. arXiv:0802.4161 . Bibcode:2008ADNDT..94..781C. doi:10.1016/j.adt.2008.01.003. 1 2 Thayer 2010, pp. 64. 1 2 Pershina 2010, p. 502. ↑ Pershina 2010, p. 503. 1 2 Thayer 2010, p. 83. ↑ Fricke, B.; Greiner, W.; Waber, J. T. (1971). "The continuation of the periodic table up to Z = 172. The chemistry of superheavy elements". Theoretica chimica acta. Springer-Verlag. 21 (3): 235–260. doi:10.1007/BF01172015. Retrieved 28 November 2012. ↑ Winter, M. (2012). "Flerovium: The Essentials". WebElements. University of Sheffield. Retrieved 28 August 2008. 1 2 3 4 "Flerov Laboratory of Nuclear Reactions" (PDF). 2009. pp. 86–96. Retrieved 1 June 2012. 1 2 3 4 Eichler, R.; Aksenov, N. V.; Albin, Yu. V.; Belozerov, A. V.; Bozhikov, G. A.; Chepigin, V. I.; Dmitriev, S. N.; Dressler, R.; Gäggeler, H. W.; Gorshkov, V. A.; Henderson, G. S. (2010). "Indication for a volatile element 114". Radiochimica Acta. 98 (3): 133–139. doi:10.1524/ract.2010.1705. ↑ Kratz, Jens Volker (2012). "The impact of the properties of the heaviest elements on the chemical and physical sciences". Radiochimica Acta. 100: 569–578. doi:10.1524/ract.2012.1963. ↑ Düllmann, Christoph E. (18 September 2012). Superheavy element 114 is a volatile metal. Thayer, J. S. (2010). Relativistic Effects and the Chemistry of the Heavier Main Group Elements. doi:10.1007/978-1-4020-9975-5_2.